We have finally moved into our house. It was a busy few months, but things are starting to come together and I feel like I am able to talk about it now. I joke. It's only now I have things to talk about and have the time to do so. Welcome to the living room. Or sitting room, parlour room, library room... whatever you like to think of it as. This was the room we were meant to forget about. Close the door on. Pretend it wasn't there. We had zero funds in the budget for this room, so it was always on the bottom of the "to do" list. I can tell you here and now that tackling this room on the limited funds we had was probably the best thing we did since moving in. We use it regularly and it is a beautiful space to relax in. The time and extra cash we managed to find was well worth it. 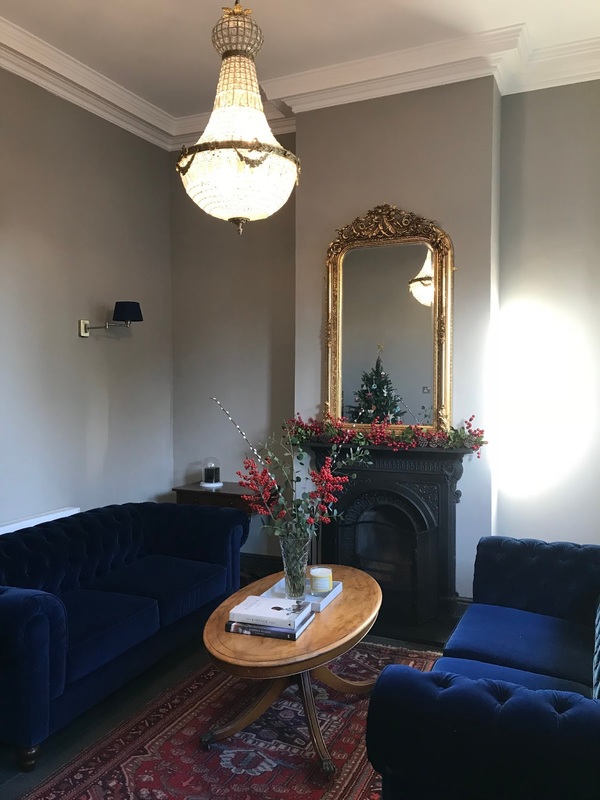 I want to share how we did it and offer some tips for anyone thinking of tackling a sitting room (or room they often refer to as the junk/store/spare room) with limited funds. As you know, our house is a split level, victorian terrace built in about 1890. 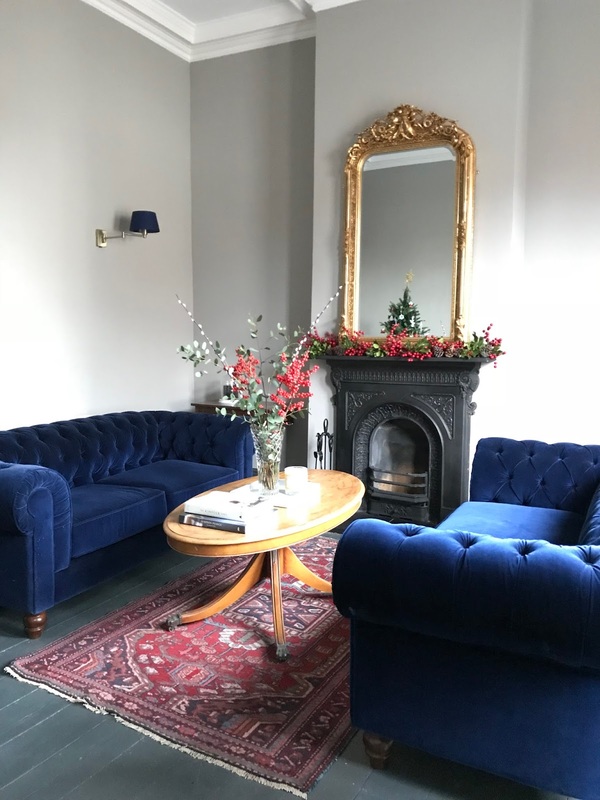 It is a quirky layout (as my Dad likes to refer to it as) but the one room that sold the house to us was the sitting room at the front of the house. Above is a photo of how it looked when we first got our keys last year. Not too bad right? 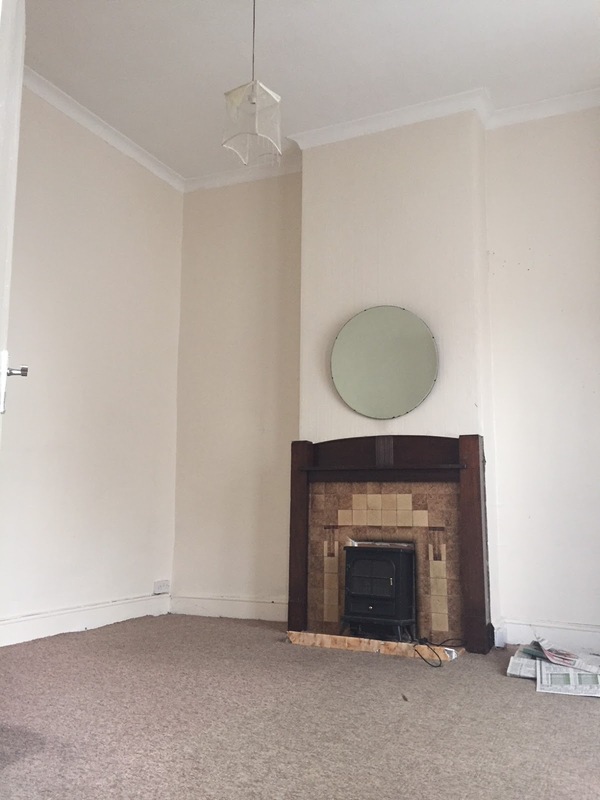 Beautiful ceilings, 12ft high, original timber floor, ugly 1950's fireplace. Big bay window. The room had potential. Potential as the main store room for the builders. They based themselves in this room because it was the only room in the house that wasn't being torn apart. 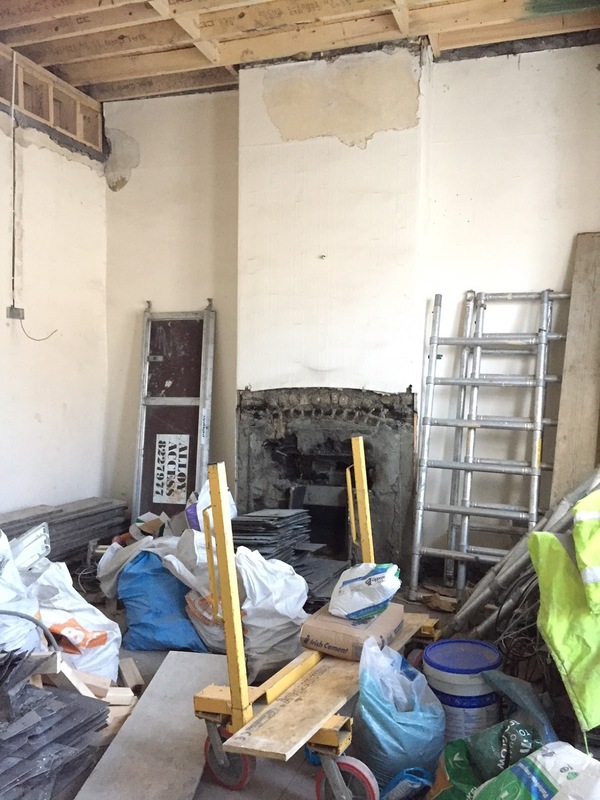 They removed the fireplace and took the ceiling down to replace the ceiling joists, the old ones were too thin and almost rotten. The sitting room looked like the photo above for the best part of a year. It didn't bother us too much because our focus was on the extension and making the rest of the house look good. However, once the rest of the house took shape, we felt this room was letting the side down somewhat. It was time to tackle it and put some sort of shape on it. I know this might seem like the most basic of tips that ever there was, but it's your first step towards your end goal of making over your room. We cleared out this room on several occasions, but the rubbish just kept reappearing. Probably because we weren't being strict enough with ourselves and others working in the house. When a room looks neglected, it will continue to stay that way. We spent several evenings and weekends removing stuff, bit by bit. We didn't have money for another skip, so we gave things away, recycled what we could and took the rest to a dump. Finally it was clear! Our room needed to be re-plastered. It made sense to do that kind of dirty work now before we put any more time, effort or money into it. 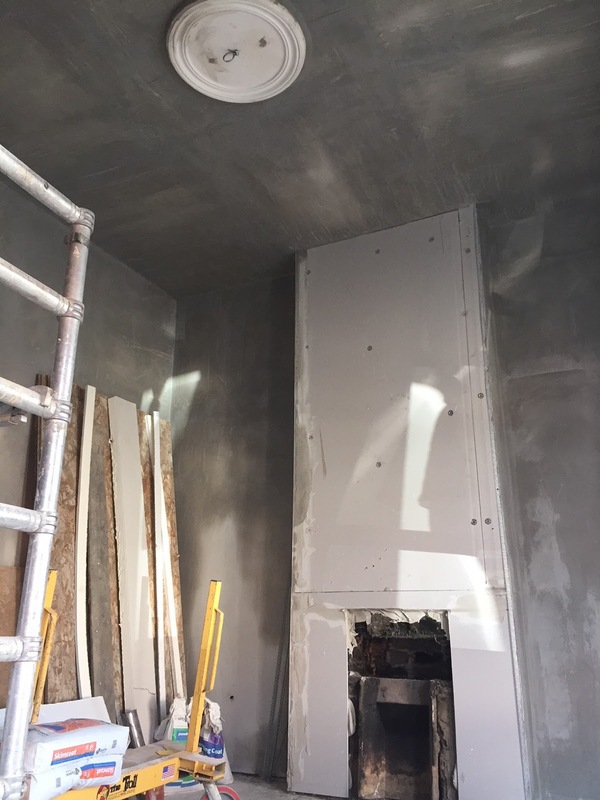 We asked two plasterers we knew to take on the room when they had time themselves, so they worked evenings and weekends. It took a bit longer, but worked out cheaper and we got the same result. This room would originally have had cornice and a ceiling rose. Both had been removed at some point in the last 100 years. 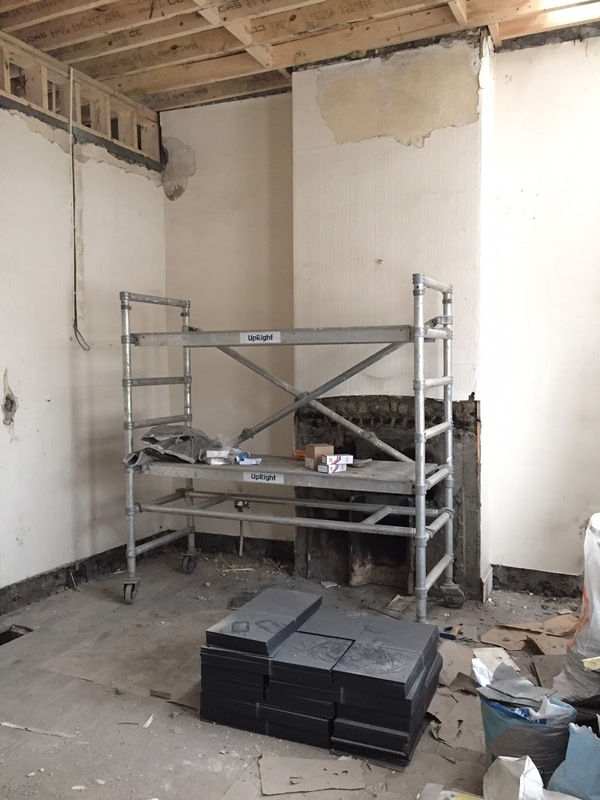 I have spoken to many people on Instagram who have encountered the same scenario when renovating old houses. It is so frustrating! All I can say on this is shop around. Search eBay, your local salvage yard or plaster works. I got the ceiling rose for half the price because it was a bit rough around the edges (literally) and was on display in the plaster warehouse. 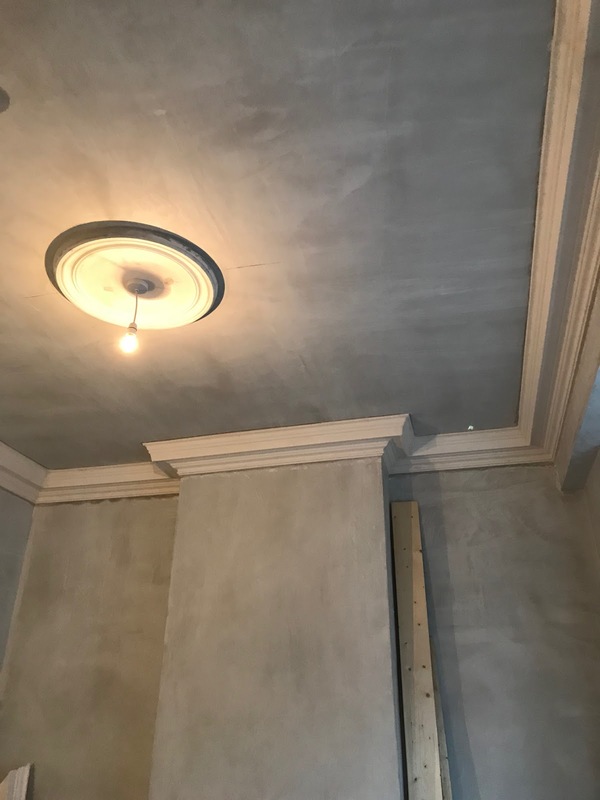 The cornice was the biggest spend in this room, but again, I shopped around and got different prices with and without installation. It is amazing the difference in price when you do the leg work. The original fireplace would have been cast iron. I know this from speaking to one of our neighbours who still has theirs. In Dublin, these can be very pricey. So do what I did and rescue one from a skip! I sourced a second one for our bedroom online, for very little money. Both required a bit of elbow grease to bring them back to life, but if you are willing to go about things the long way and take your time, you will save money in the end. Ours cost the price of the paint stripping material and a few days of my own time and I think the new/old fireplace looks great in the room. A coat of paint can transform any room. 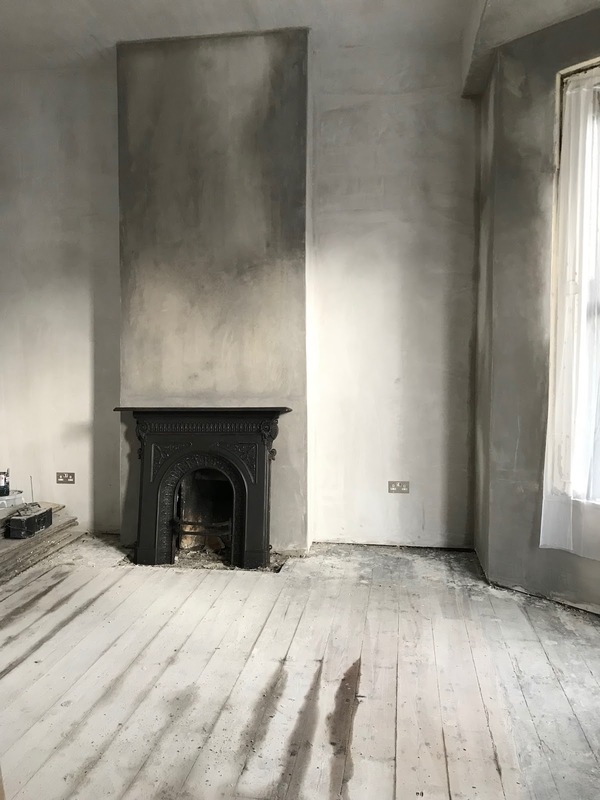 I coated our fresh plaster with white emulsion as a base for the next colour I had chosen. I was recently introduced to the Little Greene Paint Company who have the most gorgeous range of heritage colours but with a modern feel. I have used so many of their colours throughout the house and I love the feel they give each room. As we were on a budget, I had the colour I wanted (French Grey, Dark) colour matched in a cheaper Fleetwood base paint. The room is really big, but I wanted impact without the colossal paint cost. I saved myself several hundred euro doing this. And it looks just as good. 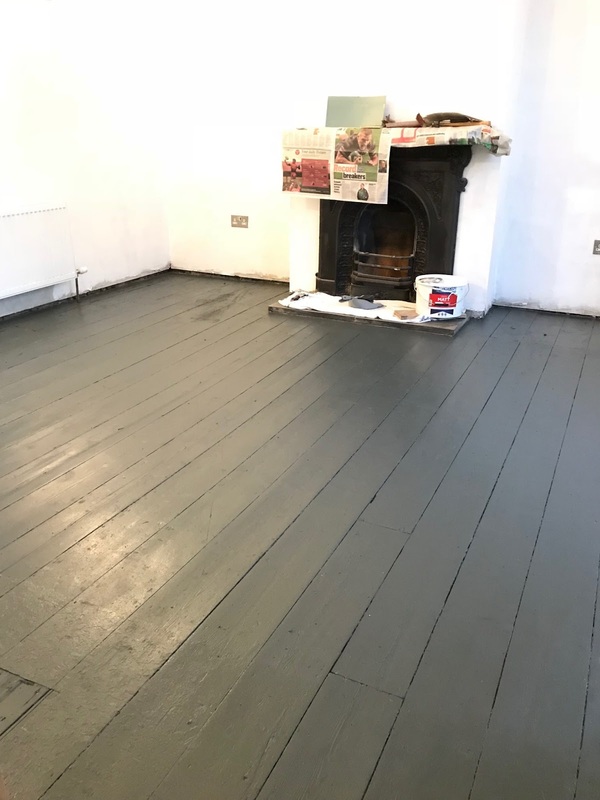 Unfortunately for us, the original timber floorboards were in very poor condition when the carpet came up. 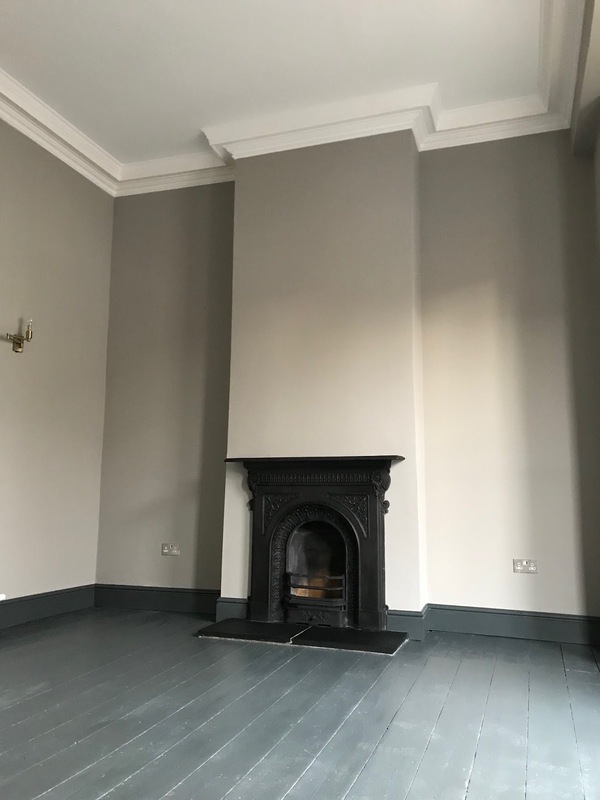 I really longed for one of those moments like you see on the property programmes, where they pull back the carpet and reveal a beautiful, original parquet floor, or knock through a plasterboard wall and find a gorgeous fireplace with beautiful tiles. Maybe in the next house. The cheapest solution was to paint what was there. Again, I colour matched Down Pipe Grey from Farrow and Ball in a mid sheen emulsion. The floor took 3 coats to get right. I cleaned it, sanded it lightly and filled any big holes that were there before applying the paint. I probably should have applied a primer, but I was too impatient. The floor is wearing very well though, but we do have a large rug covering the majority of the floor. Once all the painting was done, it was time to dress the room. We had purchased two chesterfield sofas long before we had even gotten our keys. They were a bargain and we knew that we would base our sitting room around them, so we stored them for several months. Everything else that is in this room is second hand. The rug was bought from a vintage store locally. The coffee table was bought online (I stripped, sanded and stained it to give it a bit of a makeover). The mirror and chandelier were a Christmas present to ourselves and because we bought a couple of pieces we got a discount. They were purchased in an antique shop locally also, but were great value and cheaper than a lot of new alternatives. The window blinds are from Ikea. I cut them to size and hung them mid way on the sash windows. Our house is higher than the footpath outside, so when these blinds are down we get privacy from the road but they also allow light to stream in on the top half. Down the line I would like to buy shutters, but for the money I think €33 in Ikea was well spent. This room has turned out so much better than we expected. It would have been a shame to close the door on it and put it on the long finger. 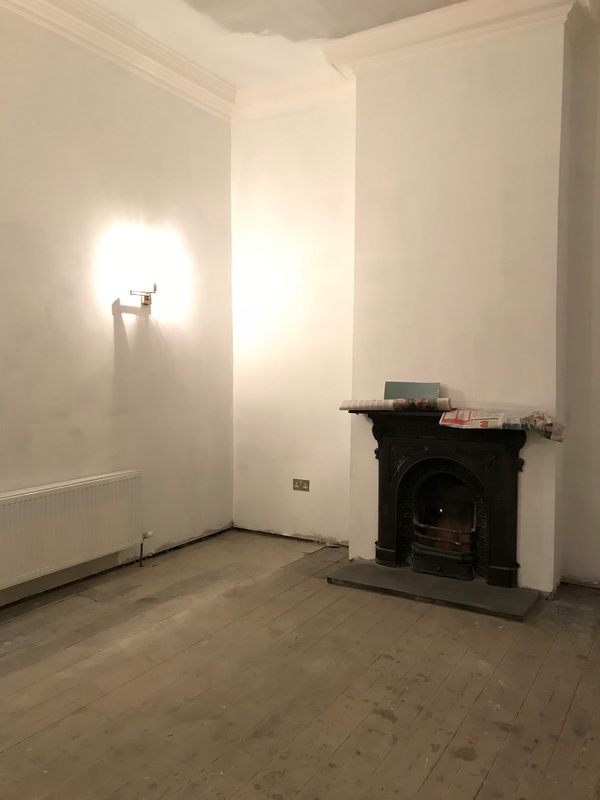 It is the main reason why we bought this house and now we can sit here and enjoy the beautiful high ceiling, light the fire, listen to music and chill out. Maybe enjoy a well earned gin and tonic, or three. It fels like the reward for all the hard work. Adding some flowers and our own bits and pieces, books, photos etc helps make it feel cosy. I have yet to add any thing to the walls, but will choose my art carefully. If I am going to put a screw into those beautifully smooth plastered walls, it will be for the right picture! So tackle that room that is annoying you in your home. Trust me, you will be glad you did.